Discussion in 'JS Plugin Releases (RMMV)' started by Rexal, Oct 28, 2015. - Added the SV Sprite tag which lets you specify the image you want to use, removing the admittedly silly requirement where you had to have a matching sprite. - Works in both Front and Side views. 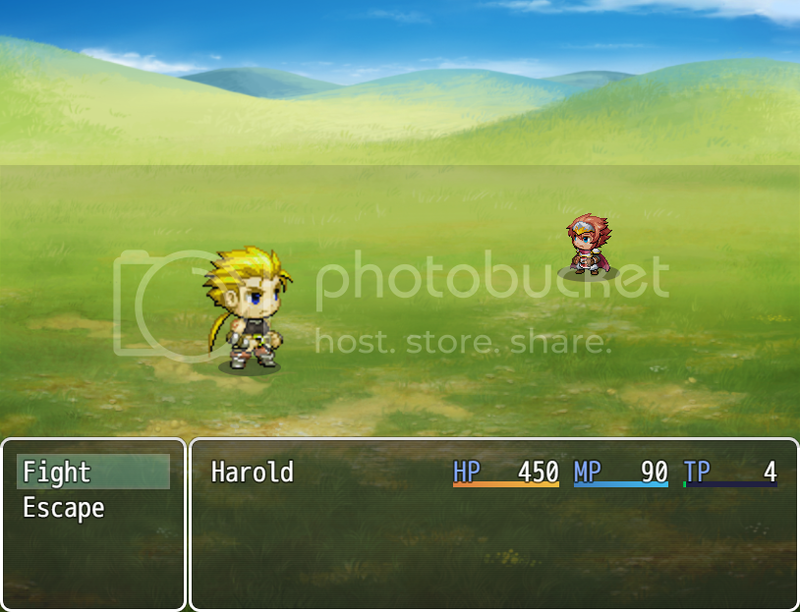 - Enemies are animated and can use SV actor sprites. - Define what enemy isn't animated. - SV Battlers are automatically flipped so they're facing the heroes. - SV Battlers obey your hue settings. - SV Battlers can use weapons. - Static Battlers have a customizable breathing effect. - Static Battlers can have floating animation similar to rm2k3. - Enemies can be scaled. Note: Even though it's called SV, it'll still work in the front view. That's just what MV calls that type of battle sprite, so that's what I call it since I don't have a better name for it. Debug - Will write to the console if true. This is so that you can see if everything's working correctly. No Movement - If set to true, this prevents enemies from moving whenever they perform an action. Can potentially be overridden by another plugin. Enemies Celebrate - If set to true, SV enemies will play their victory animation when you're defeated. Static Enemies Breathe - If set to true, regular enemies have a breathing effect. AGI Effects Breathing - If set to true, enemies that have a higher agi stat will breathe faster. Scale Statics by Distance - If set to true, this will shrink enemies by how far they are from the bottom of the screen. SV Enemies Collapse - If set to true, SV enemies will always play the default collapse animations. Damage Slows Down Breathing - If set to true, enemies will breathe slower the more damage they take. multiplies the size of the enemy by this amount. Makes the enemy use an SV Actor. You must have an image in img/sv_actors that matches the name of the one you used for the enemy in the database! Makes the enemy use the specified SV Battler. You do NOT need to have a matching image with this tag. Lets the SV Enemy use collapse animations regardless of parameter settings. Prevents the SV Enemy from using collapse animations regardless of parameter settings. In other words, if you set the enemy's image to Bat, the sv_actors folder needs to have an image named Bat inside it, otherwise it throws an error. Specifies the SV Motion an enemy uses when attacking. If this tag isn't used, it uses thrust. Equips the enemy with this weapon. Prevents the enemy from playing the breathing animation. allowed to stretch width-wise and height-wise. example below is the default settings. Makes enemies have a floating effect similar to rm2k3's. - Added the SV Sprite tag which lets you specify the image you want to use. - Potentially fixed any issues with sprite flipping. - Enemies no longer synchronously breathe. - Changed the way weapons are handled to improve compatibility. -damage popups pop up again. -Massive rewrite that should fix a lotta issues. -SV Battlers are now recognized as enemies. -Changed the version naming scheme. -SV Overlays should face the right way. - Note tags are no longer case-sensitive. - Fixed the positioning officially. - Fixed the floating issue. - some other thing I forgot about. - Added an option that lets enemies scale down the further into the background they are. - Enemies can celebrate your demise. - Fixed the Flash Target bug. - SV Enemies can collapse. - SV Enemies will properly appear. - Enemies have a proper escape animation. - Enemies are now properly positioned. - You can now scale the enemies however you want. - Fixed the mouse clicking completely. - Floating enemies no longer zip out of the screen if their x position is modified. - The breathing notetags work now! Yay! - Added [Float], to make enemies have a floating effect. - Static enemies breathe now. - Did something stupid and broke everything but it's all good now. - Created a separate plugin for yanfly plugin compatibility. - Still has the Flash Target bug. - Makes this more compatible with Yanfly's scripts. - Fixed issue with enemies not playing the right animations when more than one enemy is on the screen. - Misc. Fixes that I've forgotten about. - Added SV Weapon, which lets you play a weapon animation(currently backwards). This is not yet compatible with my other script: Sprite Weapons Enhanced. - Added a param that stops enemies from moving when performing an action for those who don't want that. Roden124, Sunight Games, Ronpa and 93 others like this. I'm gonna check to see if this works with Yanfly's Action Sequences (even without a weapon). If it does, you win the internets. Wow I've been waiting for this! Thank you and I will keep an eye for the future updates good luck! Question, does this support any size for battlers like how the actors battlers work? Wow that was quick. Cheers! Well, it does in fact use them, but doesn't completely use all the actions. I only tested with jumping and moving to the designated point (front base) and the enemy did that, but did not jump. Close. Still, this is pretty awesome! Kudos, good sir. I'm getting the following error, I'd imagine it's because of Yanfly's Battle Scripts. TypeError: undefined is not a function at Sprite_EnemyRex.Sprite_Battler.updateSelectionEffect I'm having a look through the JS because I'd like it to work haha. Try turning off the Yanlfy plugins and see if that helps any. I've been experimenting with Yanfly's plugins and this one for a few minutes, I get the same error only when Yanfly's Core Engine is turned on. If I turn it off it's fine. At the very bottom, I also have TDDP_BindPicturesToMap, so that's the whole list. I'm gonna see if it gives me that error when I don't use an action sequence. Well, at least it semi-works! I'll have a look at Yanfly's script and see what I can do. Thanks I try to make it as compatible as possible so that people can use whatever scripts they want with it. It's looking like you have to put it as far down the list as you can, since I had to overwrite a lot of functions in order for the plugin to work. I'll try to make it play nice with Yanfly's Core engine, but we'll see. EDIT - It works fine if you set Flash Target in Core's parameters to true. I have no idea why it does, but it does. So, I ran more tests. I placed your script above the Battle Core Engine, but below Core Engine. No error, but no SV motion if not using an Action Sequence and no damage animation. Tested again with it above Core Engine. Same thing. Kinda surprised everyone else got the error. Still, good to know you're going to look into it. OH, one thing I did notice though. Can't mouse click enemies using the animated battlers. I can attack them with the keyboard (and I'm sure the Gamepad), but not the mouse and I clicked everywhere near the enemy. No go. Since djDarkx can get it working with essentially the same load order as me, I think the solution may lie with one of the additional plugins he has that MechaGS and I don't. Probably either SVActorPosition or TDDP_BindPicturesToMap. But if even one person can have both Yanfly and this working together then you shouldn't need to edit this plugin. Either we did something wrong or djDarkX did something right. Skurge " (GASP) What's going on!? " Gonna try this one out because i really want battles to look nice. So basically if i want an animated enemy I have to pretty much use the same sheet like the player heroes? do they need to be flipped or does the engine do that automatically? Just tested it with TDDP_BindPicturesToMap and can confirm that doesn't fix it. Not sure on what SVActorPosition is though, not seen that one. Try setting the "Flash Target" parameter in the Core Engine to true. The plugin does it automatically. It'd be way too much of a hassle if you had to do it manually. Oh, that fixed it! I guess djDarkX already had it set by chance? Now I'm seeing what he meant when he said that you can no longer click enemies, though. That's a shame. Still going to use the plugin because it's crucial, but I was enjoying the clicking while it lasted. Fantastic and I'm with Sera on this as it really is a crucial part of what I needed for my game. I look forward to your updates! Oh, I didn't even notice that part of djDarkX's post and I don't use the mouse so I didn't even notice that....whoops.